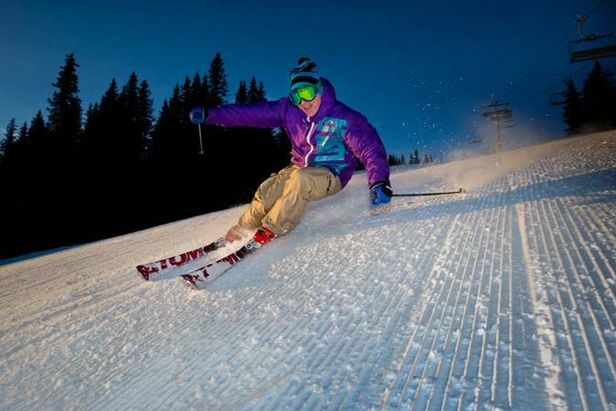 The special experience known as "tidlig-ski" (literally ‘early-ski') means you can hit the slopes in the pre-dawn floodlighting from 7 in the morning. For the locals this means they can have a couple of hours of skiing before they go to work. Those who take to the black pistes of Høgegga, freshly groomed, will find themselves almost all alone when the special early opening rakes place every Wednesday and Saturday. The pistes here are wide and great for long carving turns at high speed. "The slopes are fantastic, and you have them almost all to yourself. A couple of hours of skiing, and then off to the office. There's no better way of starting the day," said work colleagues Mats and Pontus Åkesson. To take part in the early morning sessions you need to purchase a special ticket, which includes the cost of breakfast, but which are limited in number, so it's a good idea to reserve in advance. The black pistes of Høgegga are for many skiers the very best sector of the extensive terrain available at Trysil which number 60 pistes in total. All lifts are currently operational and there is fresh snow is forecast for the weekend. The early ski sessions will continue right through to the end of Trysil's long season is late April, by which time it will be light long before 7am.